I went to pick up my copy of Killzone last weekend and was thwarted at two stores. They had just sold out, they told me. I guess it was good news for the game, but I was beginning to get nervous about making a review without an actual copy. Luckily another store had one copy left, and I rushed home to try it out. Hard to tell from a still shot, but it was cool to see that vehicle land! I plugged in my headphones, locked the door to not be disturbed, and loaded up the game. The opening logos zapped onscreen and I was in the game. Like many others, I had played the Beta and got a good taste for the multiplayer aspect of the game, but wanted to know what the campaign mode would bring. What I saw was everything I was looking for in a handheld console first person shooter, and more. When you first begin the campaign, you are thrown right into the action. There is a great sense of scale for a handheld game; environments look huge and detailed, there's a lot of stuff happening in the background. I was pretty busy snapping screenshots as I was in awe from all I saw around me. And the second I flew out the window to dive to my next location I was sold on the game. Graphics are about as good as I've seen on the Vita. Fast moving, detailed environments, action all around... beautiful. 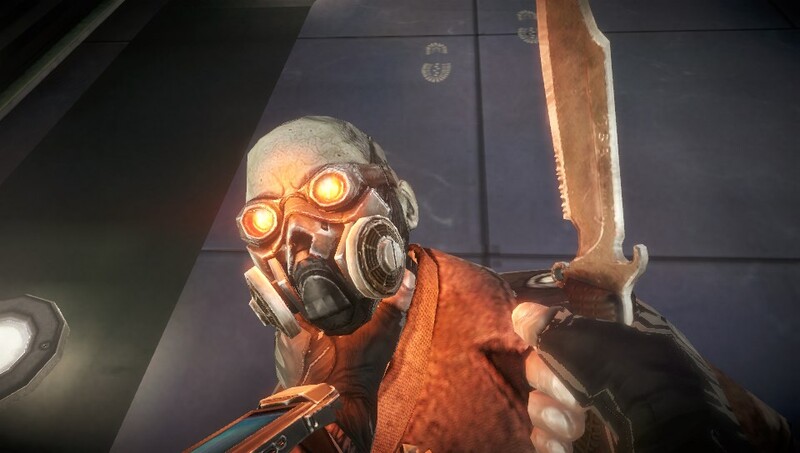 What do we look for in a first person shooter? Spot on controls. Precision aiming. Efficient radar maps. Smart AI. High framerate. 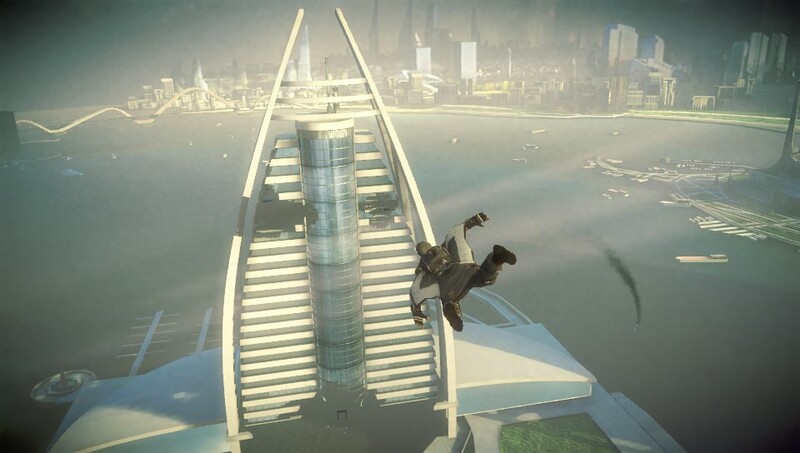 Mission variation. And of course, addictive multiplayer. 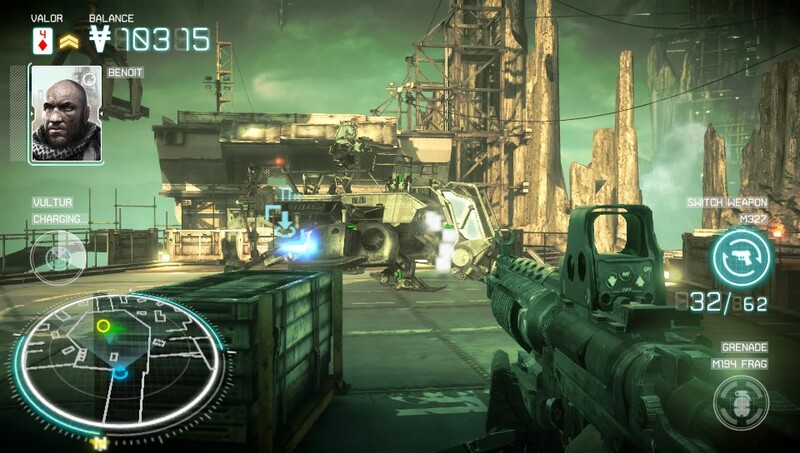 Does Killzone hit all these like it should? In almost all of these areas, it seems like the developers went above and beyond anything seen on a handheld to date. "Hold on, there's a bug on you..."
Does this mean everything is perfect? Not always. But you really have to be picky to not love what you play in this game. I was impressed by the aiming and shooting, and come on, if you can't have that, why even bother with a FPS in the the first place? You're going to spend a lot of time pulling up the left trigger to aim, right to fire. And you can adjust the sensitivity of the sticks to what you feel you need. Nailed it. Even the Helghans like sushi. 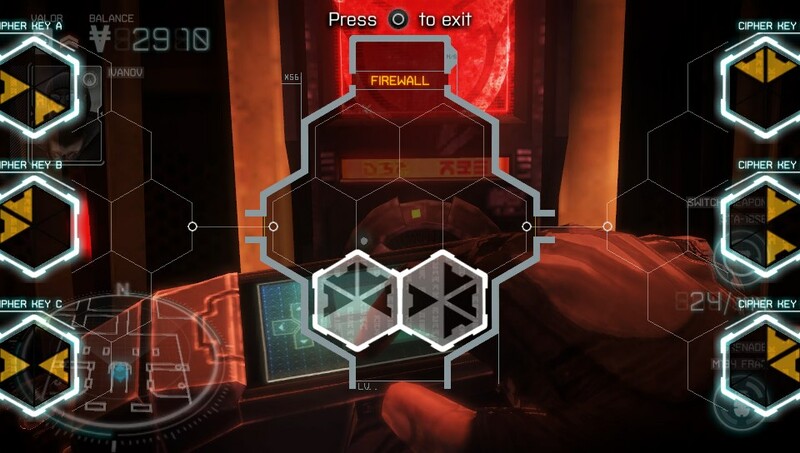 Are all the controls easy to access? There's a little bit of training on how to sprint. I sure do miss the clicking sticks to start running, but it is all a bit of training to hit the circle button to do it. Or the rear touch pad, which I didn't use that often. Swapping weapons and accessing the grenade/equipment button was a little bit of a chore too. Not as fluid as I'd like, but I can't think of how else to make the control scheme with what the Vita has. 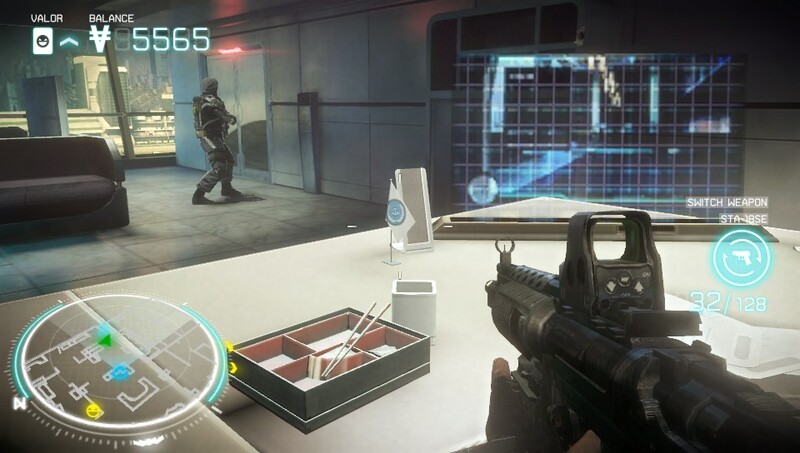 Makes me wonder what playing Shadow Fall on remote play is going to look and feel like. The map system is nice. Really nice. 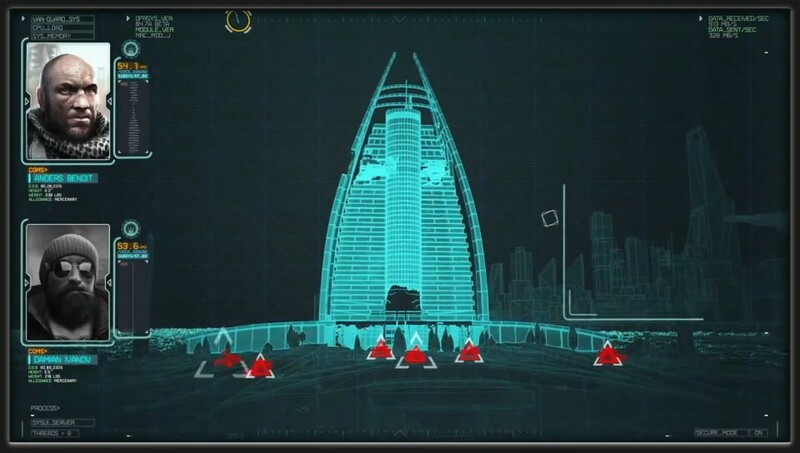 It was easy to find and follow objectives, track enemies, etc. 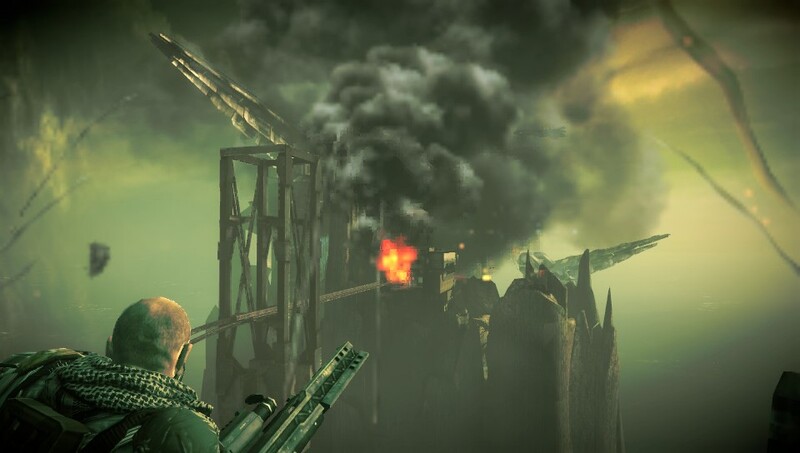 Speaking of those enemies, when you blow a stealth mission, the alarm blares and multiple enemies come at you. They play pretty smart tactics when trying to use cover against you. Still, on the first few levels on normal difficulty, I didn't have trouble mowing down the troops. I'd get hit, but not enough to kill me, and then I'd finish of the wave. The real difficulty is trying to play through in stealth. 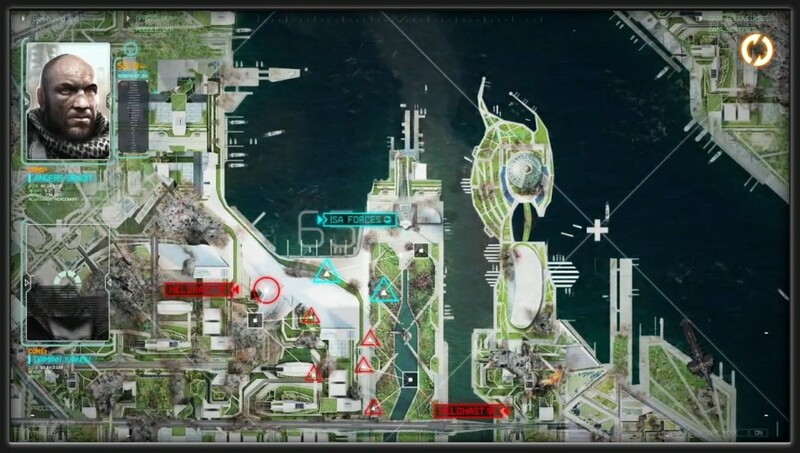 You have to plan out enemy movement, use your cover, etc. Makes for a nice challenge, and I assume on greater difficulty/later worlds, you will need this skill to be effective (and make some $ and earn some medals, etc.). The plot is one set with Mercenaries for hire as the theme. Anything for money. You are a merc hired to work for different factions... A lot of military leaders after each other, and people paying you to get a job done. 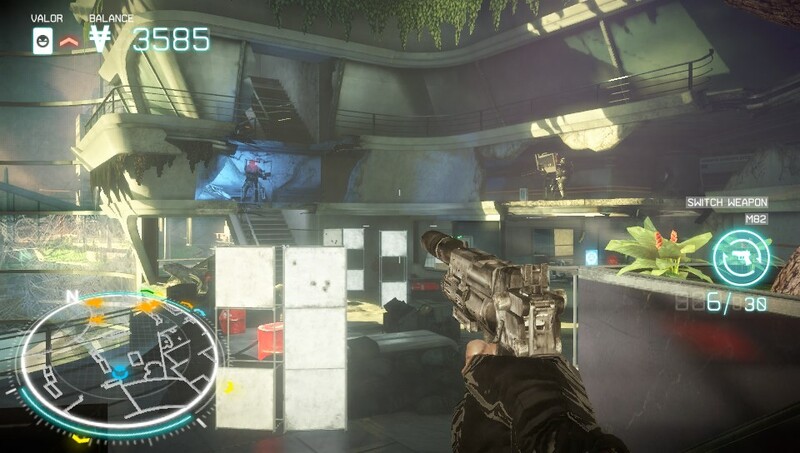 First person shooters are getting tired. You need a lot of innovation to keep people hooked. Some of the things KZ does that makes you glad they did it are the VAN Guard systems. Either in campaign or in multiplayer (MP), a warning pops up about an approaching VAN Guard. These are containers that drop in a powerful item to be used immediately. 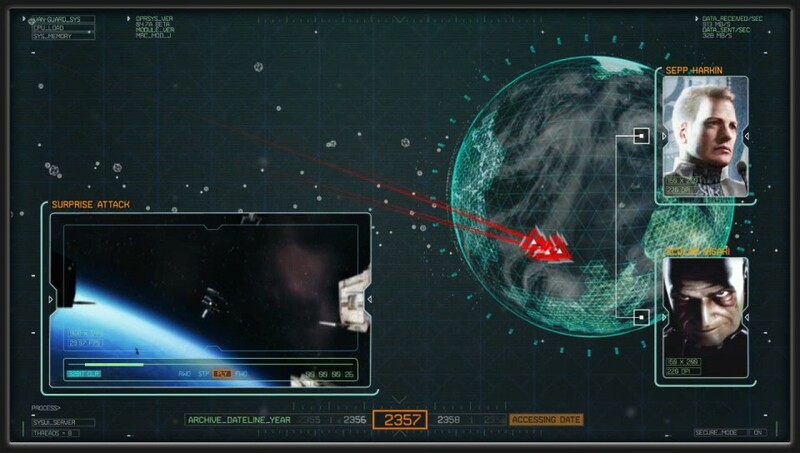 You have tracker scanners, shields, missiles, air attacks, cloaking devices... they're all fun to use, and some can be downright irritating if you're on the other end of it all (there is a drone you control and it attacks peoples heads when you zoom in on them). Are they too powerful? Maybe, but it makes it a strategic fight to find cover at some times, or pull up your shotgun when a Mantys engine is fired up. 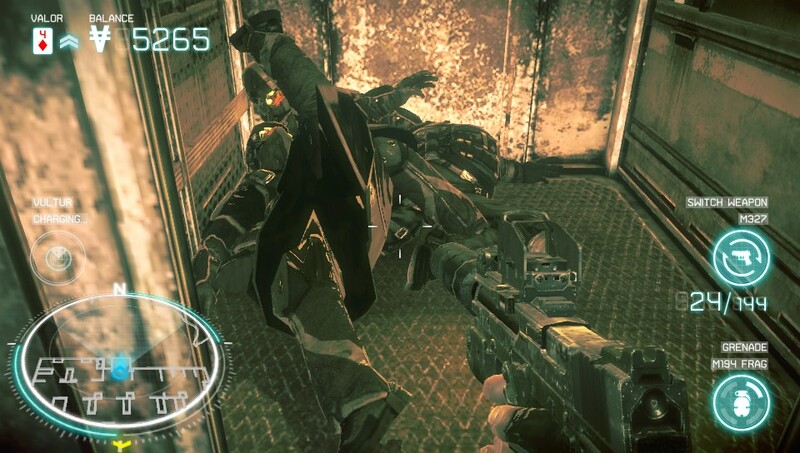 Interrogation mode in MP is a lot of fun. You catch an enemy unaware and melee them into giving you intel, which in MP ends up being enemy locations. Sweet! This really changes the pace of a match. Instead of earning points for kills, you get them for intel. The hacking system is sweet. You have to match patterns, basically, but it is fun and easy to do with the touch screen. The pressure of being attacked while hacking makes it that much more intense! There are three types of MP matches: you vs. everyone, team deathmatch, and "Warzone" which mixes up the action. You earn points for deathmatch, hacking VAN Guards, and interrogating people. Good to keep it fresh. 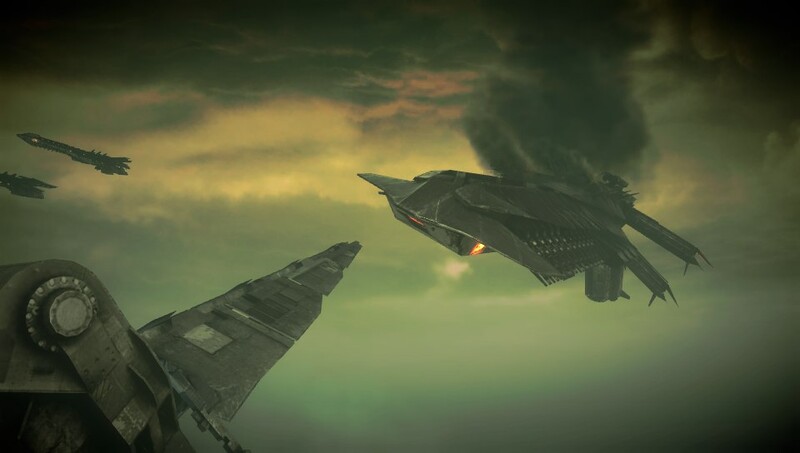 This is something you will sorely miss the more you play MP. For only a team of 4, the game really encourages teamwork. If you drop into a match you can't just chat with the strangers. What? There is a mic on every Vita, why can't they do this? No, instead, you have to friend people who have the game, ask them to join a party with you on the Party app, launch the game, go to MP, select Join Party, then you can do it. Easy? Nope. Never going to do it. Irritating. It could be a perfect game, really. This is what is bringing it down. MP is great, don't get me wrong, the maps are balanced, varied, and pretty. 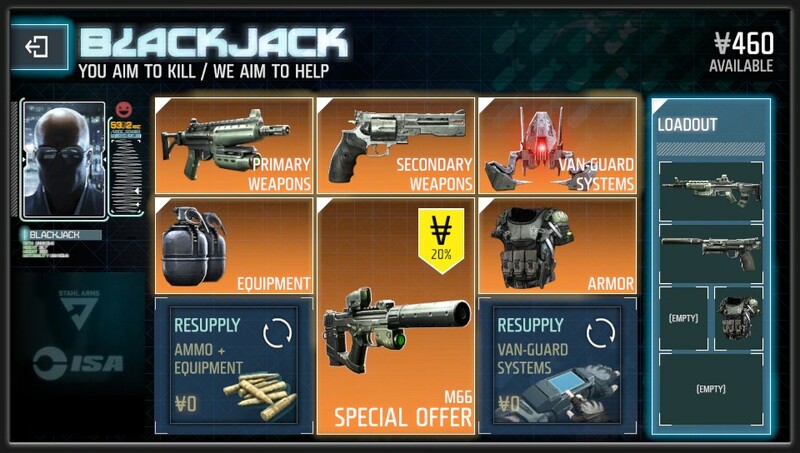 Access Blackjack to upgrade you gear! Only 9 levels in the game for single player? You'll be done before you know it if you want to just get through the missions lickety split. However, if you want to accept the "Challenges" for each level later on, you can go through and meet certain criteria (use x weapon, rescue x captive, eliminate x officer, etc.). This extends the gameplay in some respects. What you earn in single player carries over to Multiplayer! That is a cool feature for those of you who want to get a little bit more money to spend or use in the MP. Whatever you purchase in either mode, you then have access to in the Blackjack dealerships littering the maps in single player, or when you suit up in MP. That was a great perk. Best game moment I had? I tossed a grenade into an elevator of 5 guys. It was bloody brilliant. 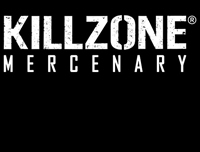 If you visit the Killzone site and click through to the community page, you can access a ton of things about your progress (and others on leaderboards). You can see you rank, your weapon stats, medals, even view a top down map of you last match and see the whole thing in action. It tracks players, shows their kills, etc. Slick! Touch screen? Yeah, or meh? It doesn't happen very often that you get to see a big game like this on the Vita. You get action, stellar graphics, and a fun multiplayer mode that will keep you playing long after you complete the campaign mode. I can only hope I smell DLC map packs in the future. We need to support the market for the Vita, and buying this game will do it. It will help convince developers that the Vita is worth creating for. This review was made on a card that I purchased. Images were all in game screenshots I took. Comment below if you purchased this already, what you like, etc. Are you on the fence?